I want to take this opportunity to thank you for the assistance you have been giving to our middle management group in becoming a more effective team. 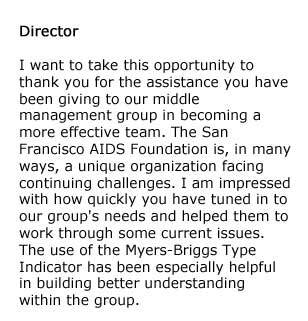 The San Francisco AIDS Foundation is, in many ways, a unique organization facing continuing challenges. I am impressed with how quickly you have tuned in to our group’s needs and helped them to work through some current issues. 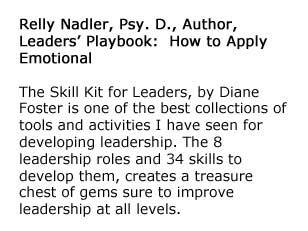 The use of the Myers-Briggs Type Indicator has been especially helpful in building better understanding within the group.